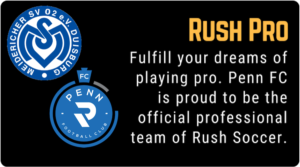 Rush Canada Soccer Academy professional coaching staff with international experience and proven track record in development and implementation of player development programs and methodologies in Europe, Canada, USA and Asia. The Rush coaching staff with access to the high level international and national coaching resources trough established personal contacts. The academy staff has long professional playing experience mainly in Europe and Asia and coaching experience in multiple countries around the world which resulted in multiple personal contacts with high standard coaches ( all former professional soccer players too) and academies/clubs. We think and work creatively, breaching all traditional boundaries that limit our ability to ascend, creativity at all levels. Rush Canada believes in thinking outside the box. Want to try out for the largest youth soccer academy in the world? Try Out Today!